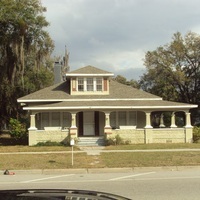 The two-story house, built in 1930, located at 511 South Sanford Avenue in Georgetown, an historic African-American neighborhood in Sanford, Florida in 2012. Dr. Edward D. Strickland, a successful Georgetown dentist, resided here in 1926. He had previously lived at 305 South Sanford Avenue in 1917. Dr. Strickland originally practiced dentistry at 507 South Sanford Avenue until he moved his office to 300-302 South Sanford Avenue, where he practiced from 1926 to 1946. From 1947 approximately until 1952, Ruby Strickland resided in this home. In 1965, Andrew Mack lived at this address and Robert Wright lived here in 1975. Rock, Adam. 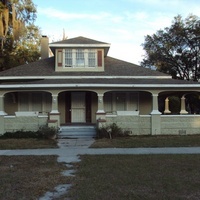 “Home of Dr. Edward D. Strickland.” RICHES of Central Florida accessed April 25, 2019, https://richesmi.cah.ucf.edu/omeka/items/show/3700.